There are a number of advantages to global auto manufacturing. But there are disadvantages as well, one of which is determining a cars “nationality”. Is a Toyota built in Kentucky American or Japanese? Or is a Volkswagen that is built and sold in China German or Chinese? Well, since I can’t find any alliteration to go with Chinese, this Chinese-market VW Phideon is Teutonic on this Tuesday. The Phideon, per Wikipedia, is the successor to the Phaeton. But whereas the Phaeton shared it’s platform with the Bentley Flying Spur, the Phideon is more comparable to the long wheelbase Audi A6. 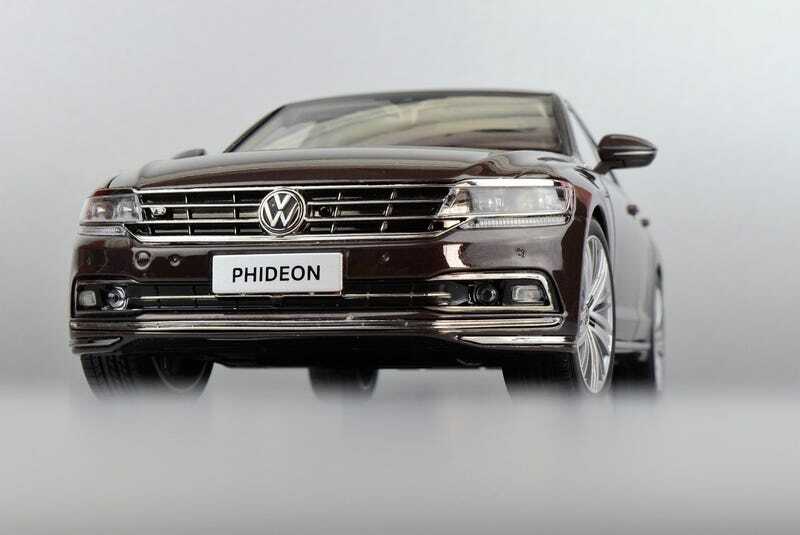 To be completely honest, the Phideon is built on VW’s MLB platform, and so is related to a number of VAG products. As is typical of Chinese dealer editions, the model is devoid of its manufacturer’s brand, but per the box it is made by Shanghai Da Zhong Gifts, which seems to be a partnership between Shanghai VW and Jaidi Toys (no, not Jada nor Jadi), a company I have not heard of before. Whoever it is that makes it, the car mostly resembles a Kyosho in terms of packaging and general build. Panel gaps are decent and paint quality is very good. The paint color is a little on the odd side. It’s nominally metallic brown, but seems to have a grey-ish hue to it as well. Very good also describes the chrome work on the model, especially the thin chrome strips that run across the tail lights. Between the lights foil letters spelling out PHIDEON patiently wait to be ripped off by my microfiber cleaning cloth. Working features are the standard Chinese DE fare. In addition to the expected doors, hood and trunk, the mirrors fold, the sunroof opens and the front seats slide back and forth. Moving back outside, the wheel/tire package looks oversized, but I’ll take that over the tiny wheels/tires that come on my Chinese Audis. The brake rotors are metal disks, but they’re loose and rattle a bit. That’s about my only complaint which isn’t bad for a model that runs around $80. If you’re a fan of VW’s or obscure luxury cars, it’s worth a look.